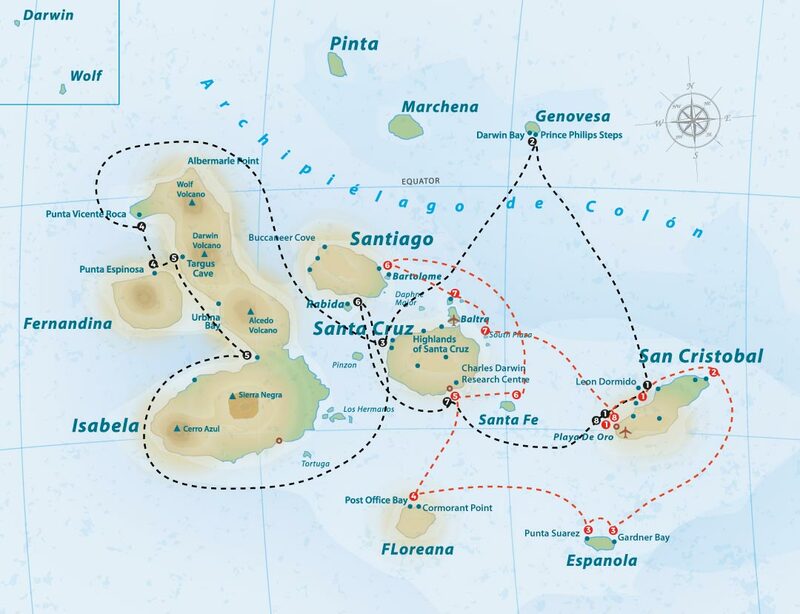 These identical yachts have been designed to be among the most eco-friendly vessels in the islands. 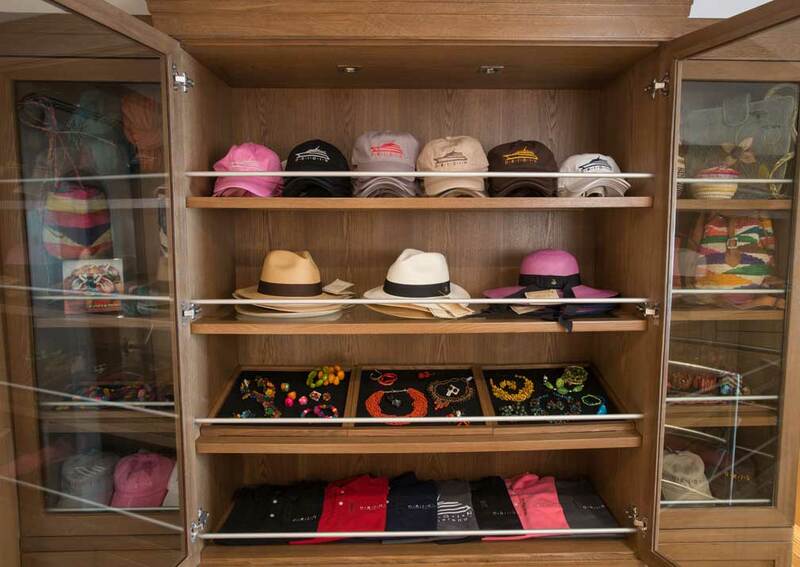 Their design is sleek and sophisticated and is matched by the highest levels of comfort and service. 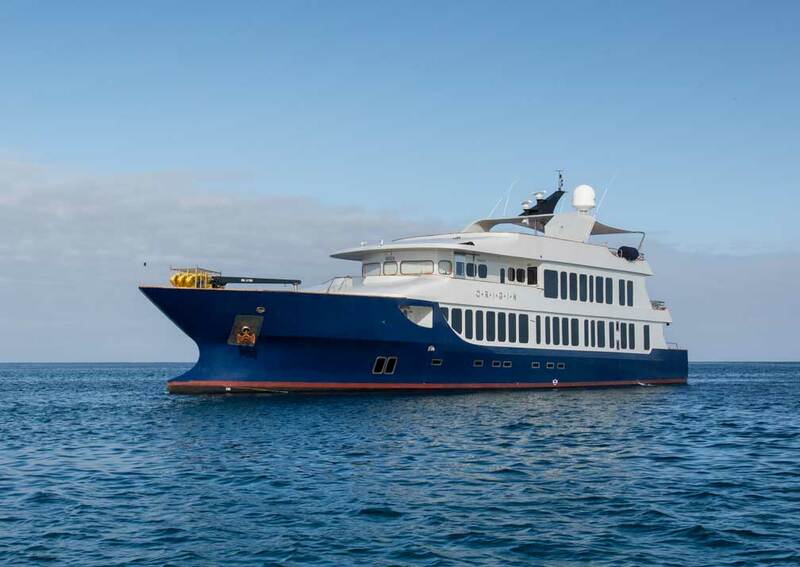 Origin and Theory are identical yachts, sleek and streamlined in appearance. 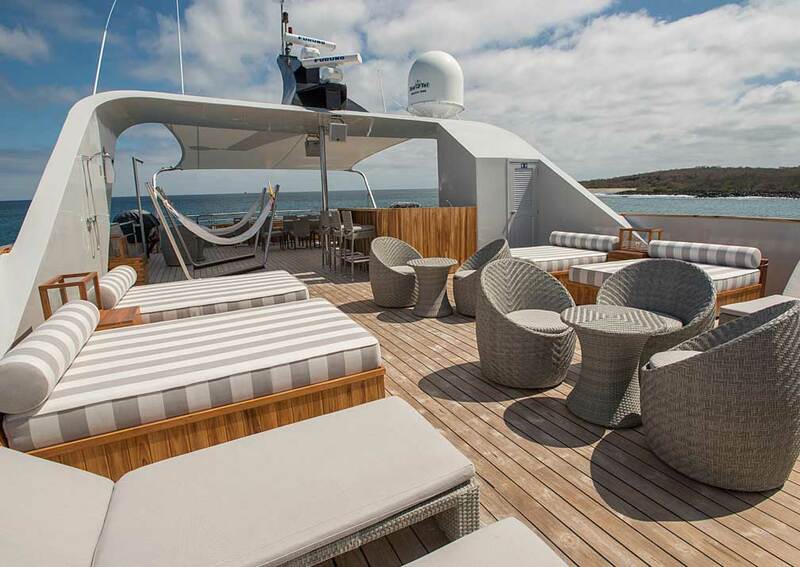 Once on board you’ll be impressed by the sense of space and range of facilities. The 10 air conditioned cabins are on the main deck. All have picture windows with ocean views. 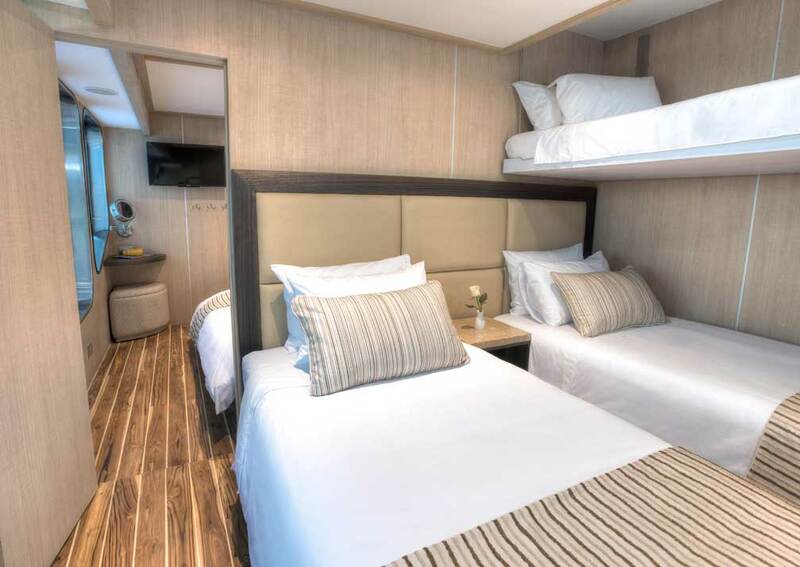 Beds can be configured as twins or a double and 2 cabins can accommodate 3 people. 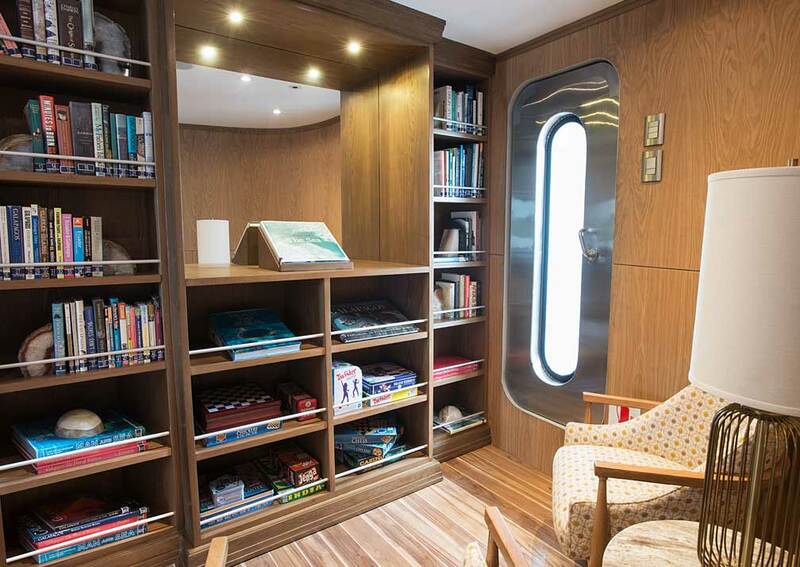 There’s room for a sitting area and each cabin will have a TV and DVD player, iPod dock and safe. The bathroom has a shower, basin, toilet, hair dryer, toiletries and bathrobes. 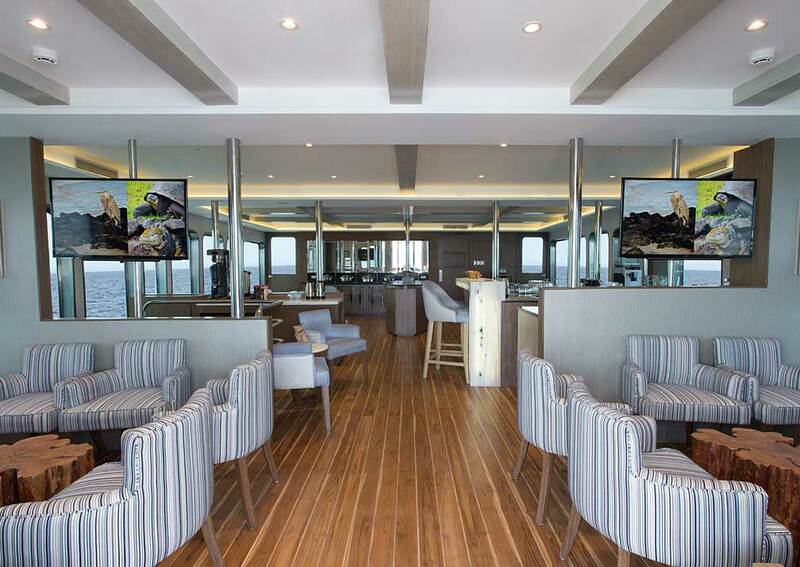 There are ten double staterooms, all located on beagle deck, and each covering 13 square metres. One (no. 8) is a double-bedded room, the others can be configured as twin or double rooms. 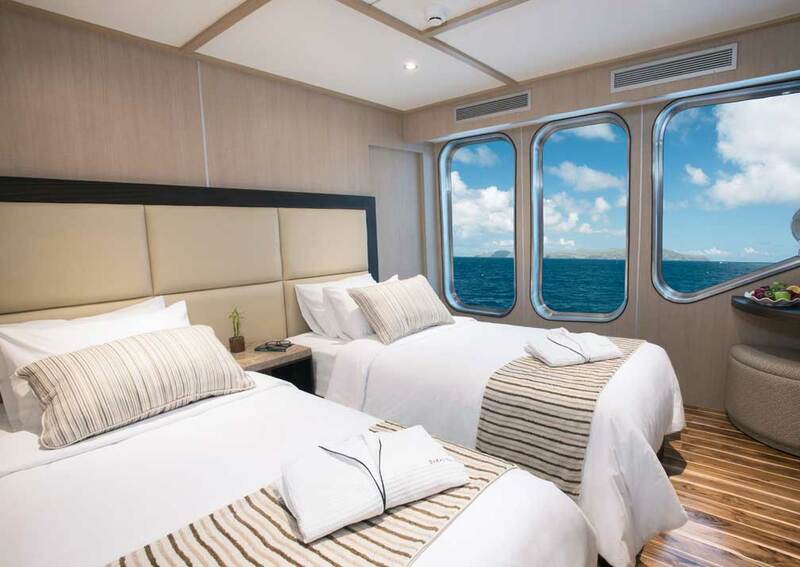 Two of the staterooms (no.s 3 & 4) can provide triple accommodation. 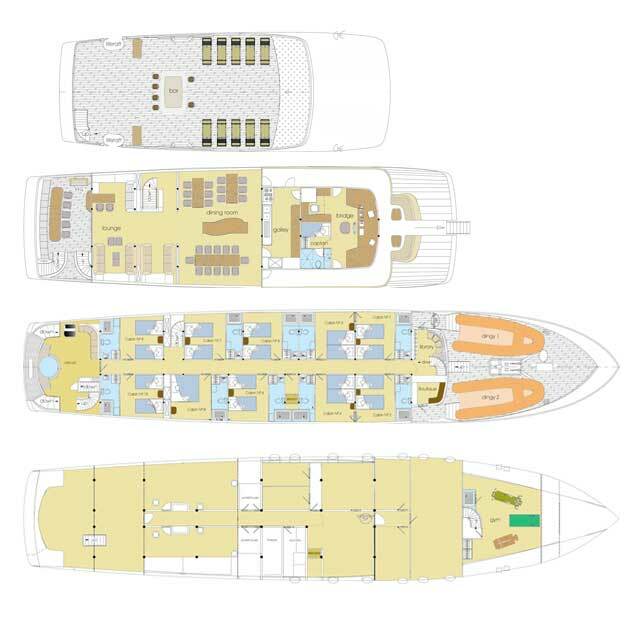 Two other staterooms are interconnecting. All have individual air conditioning, picture windows, TV and DVD player, iPod dock, safe. closet, reading lights and a seating area. Each has a private bathroom with a shower, basin and toilet, full running water, and soap and shampoo. 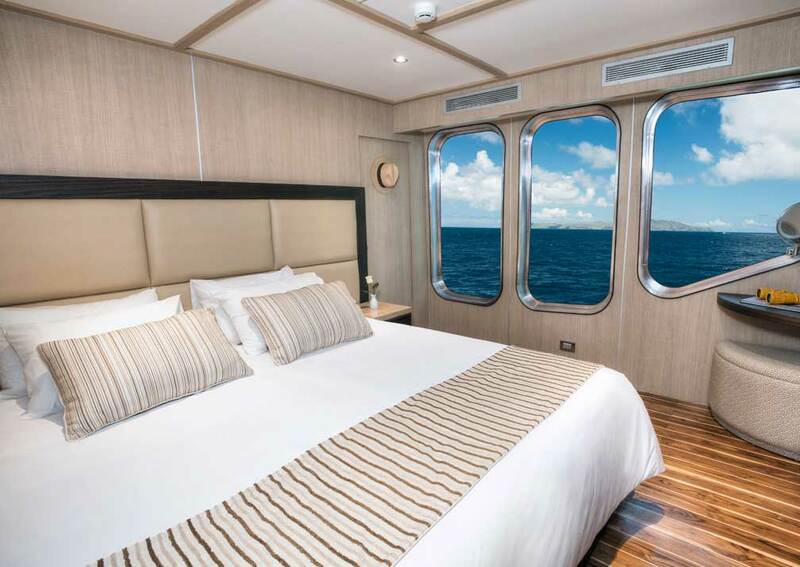 Accommodation: Ten twin/double cabins on the main (Beagle) deck, two of which can take an extra passenger. 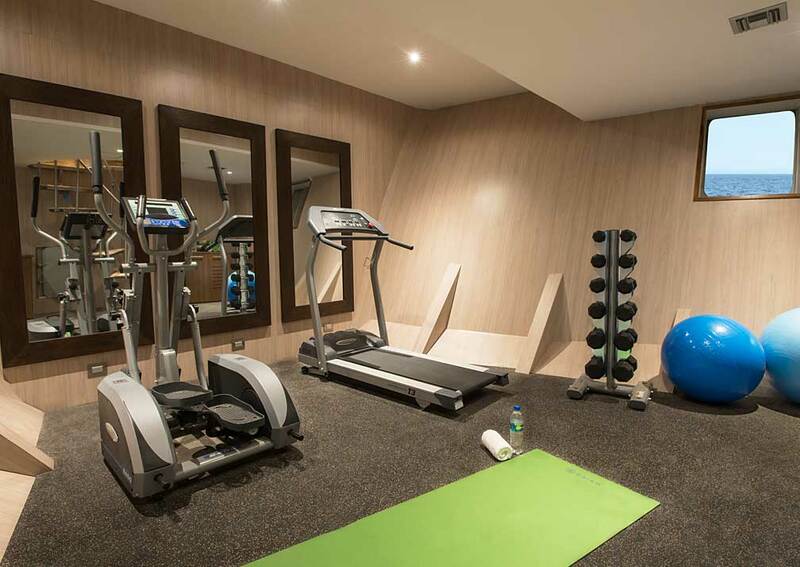 All are air conditioned, equipped with TV, DVD, iPod dock, safe, large windows and en-suite shower room with shower, toilet, hand basin, hair dryer and toiletries. 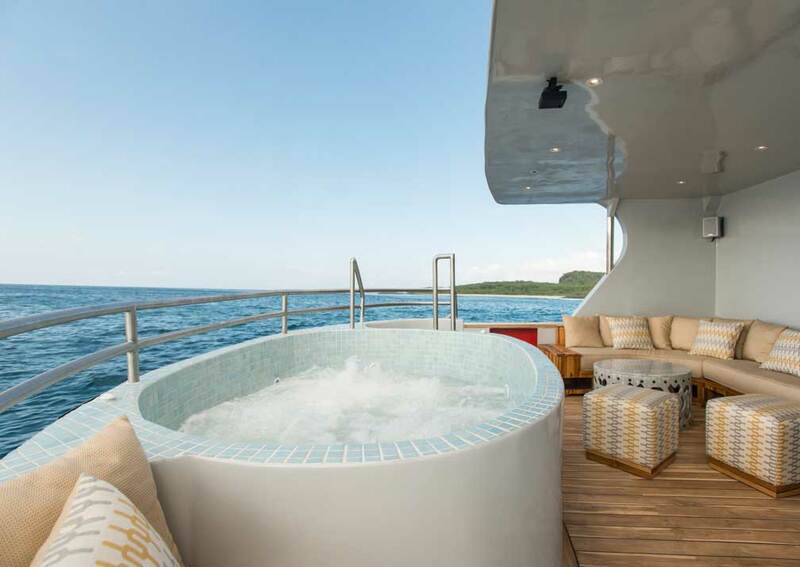 On Board: The main deck houses the library, gym and shop and outside there is a covered sitting area and Jacuzzi. 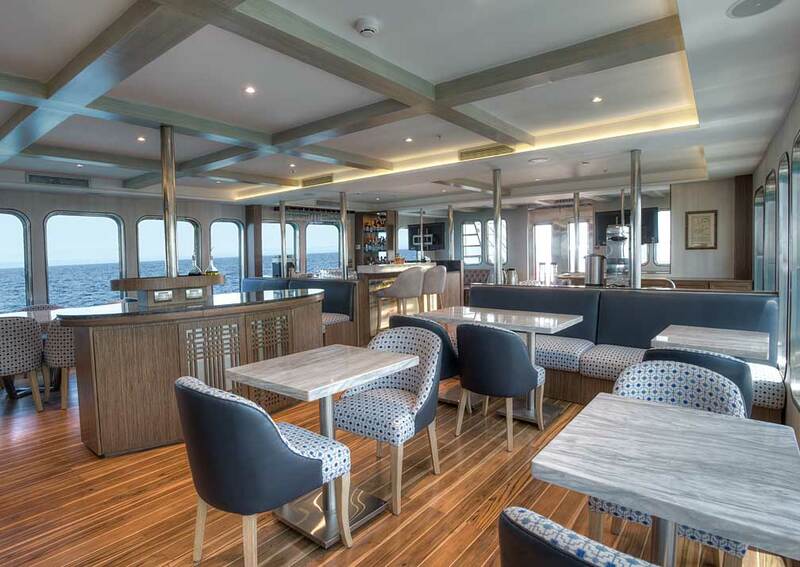 The next deck, Darwin, has the dining room and lounge and a large shaded sitting area on deck. 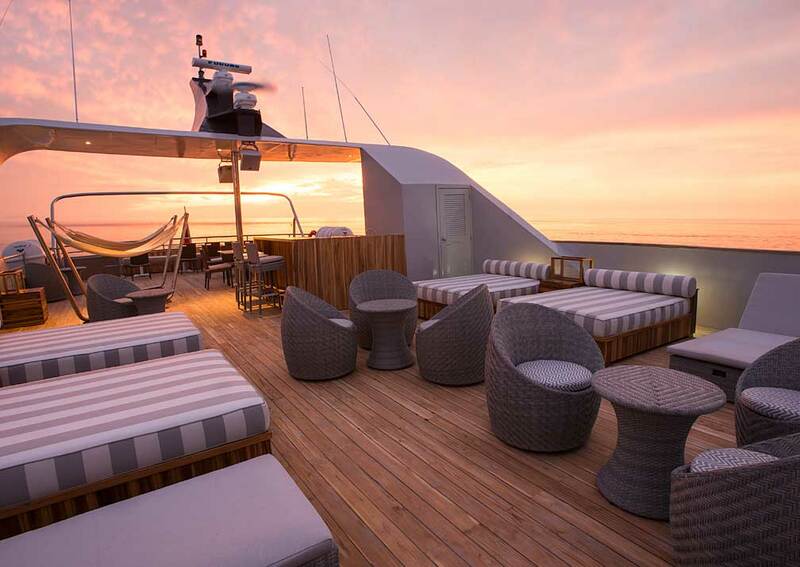 Above this on the large sun deck there are loungers and day beds and a bar. 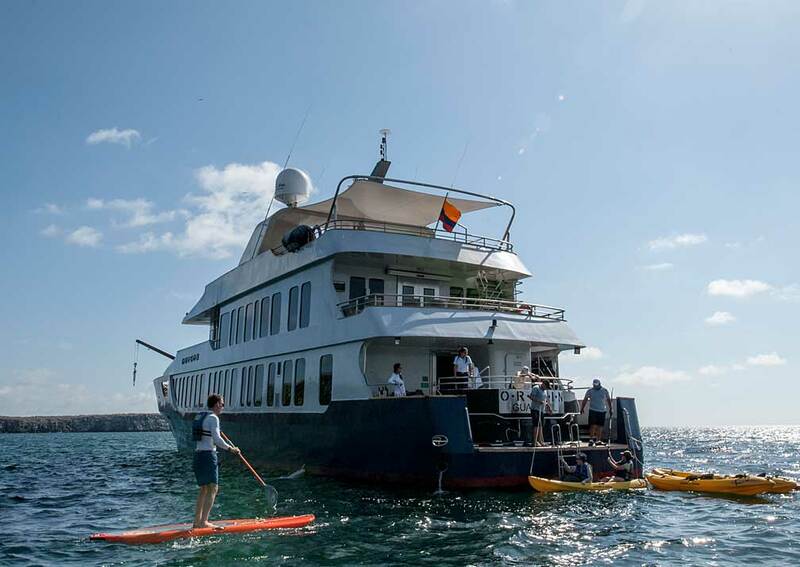 Both yachts carry kayaks and paddle boards, snorkelling equipment and wet suits. There is a glass bottom boat for marine life viewing.